This is a delightful book about patterns tied to represent a tiny insect, Ephemera danica, in a small country and yet it still manages to list at least a hundred and fifty flies, which speaks volumes about the amount of effort that goes into catching fish when ‘the fly is up’. If you have never been to Ireland in the season it can be hard to believe, but desks are deserted, jobs go undone and the loughs fill with boats crewed by anglers who have been tying or collecting flies for an entire winter. On the big loughs, a hatch can leave the cells swamped as anglers ring each other up on their mobiles to spread the word and the world cones down to the endless rise and fall of a rod and the narrow strip of water that lies before it. In this book is the stuff of those dreams, photographed by Terry Griffiths and although there aren’t so many words beyond the tying instructions, the patterns speak for themselves. 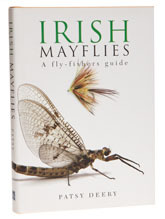 Patsy Deery is as nice a chap as you can imagine and his personality comes out in this pleasing book, which doesn’t so much attempt to answer the question of which fly you ought to fish where and when, as give you a fish’s eye view of the almost infinite variety of mayfly patterns out there. Since, as Patsy points out, many of them don’t look anything like the insects they are supposed to represent, it is anyone’s guess why they work, but work they do and in my time I have fished many of the patterns pictured here, with success. Given that it isn’t possible to have too many fly pattern books, it is very surprising to find that this is out of print now. Well worth finding a copy.